Cetorhinus maximus, more commonly known as the basking shark, is the second largest fish in the global seas and a regular visitor to UK waters. Basking sharks are now recognised to be a highly mobile species – however, the global population size and structure is at present unknown. In recognition of its perceived vulnerability, the basking shark has been offered some protection via several international agreements. The shark was listed on Appendix II of CITES in 2002, the Convention on the International Trade of Endangered Species. The north-east Atlantic sub-population is listed as Endangered on the IUCN Red List of Species. It is also offered protection via its listing within the CMS (Convention on Migratory Species) and UNCLOS (the UN Convention on the Law of the Sea). The major historical threat to the sharks existence, hunting, has been banned by UK legislation since the mid-1990’s. 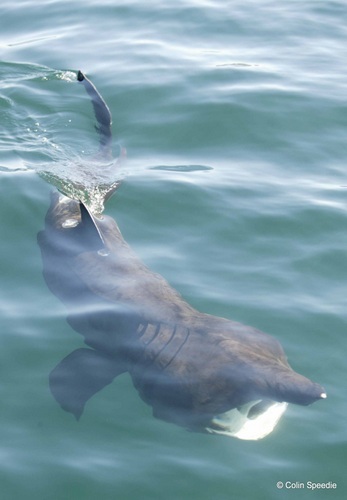 Now the main threats to the basking shark in UK waters are by-catch, accidental boat collisions, and the difficult to quantify effects from increasing levels of ecotourism and recreational boat traffic which may cause unintentional disturbance to creatures (OSPAR, 2008). Only by increasing our understanding of where the sharks congregate to feed and mate, can we aid conservation efforts by seeking effective levels of protection at those sites. In an attempt to learn more about this elusive species, Colin Speedie has organised and led boat-based, effort-corrected transect surveys in UK waters since 1999. Prior to that, he acted as Skipper on countless marine survey and ecotourism charters from the late 1980’s onward. From 1999-2007, Colin was director of the Wildlife Trusts Basking Shark Project, and from 2002-2007 was Principal Investigator on the Earthwatch Institute (Europe) project “Britain’s Basking Sharks”. Lou joined the team in 2004 as First Mate aboard the survey boat, the 11.7m cutter Forever Changes. Each weekly survey was made possible through the efforts of volunteers, and together the teams covered nearly 25,000 km of effort based surveys between the English Channel and the Outer Hebrides. One fundamental belief we have is that all that data collected has to be put to good use. Therefore, we are proud to have worked with both Natural England and Scottish Natural Heritage to publish research reports to identify hotspot sites for surface-sighted basking sharks; these have subsequently helped to guide conservation policy and direct further research. The Natural England report (published 2008), covering west Cornwall, is available here. The Scottish Natural Heritage report (published 2009), covering the Hebrides and the Firth of Clyde, is available here. For this latter report, we were lucky to be able to work with colleagues at the University of Exeter, specifically Dr. Matt Witt and Prof. Brendan Godley, based at the Centre for Ecology and Conservation at Tremough, Falmouth. We continue to offer guidance and assistance to Dr Witt who is conducting an extensive satellite tagging programme, on behalf of Scottish Natural Heritage (more info). Wave Action continues to periodically conduct short effort corrected transect surveys in the waters around the Scottish Hebrides. These surveys cover the previously identified hotspots sites plus try to extend the reach of previous transects by visiting new areas. We are always keen to hear of the field research of others.